Just in time for Christmas, EatDrinkIndy.com and WFYI partnered for a holiday cookie contest — with some very tasty results. We accepted a dozen entries and convened a panel of chefs — A. Rene Trevino of Rene’s Bakery, Nicole Ankney Anderson of Four Birds Bakery and Thom England of Ivy Tech Community College — who judged the entries along with WFYI’s Roxanna Caldwell and Don Hibschweiler. Clockwise from top: Double Chocolate Chip Fudge Cookies with Candy Cane Buttercream; White Chocolate Cranberry Pistachio Cookies; Bacon Date & Walnut Pinwheel Cookies; Kolache Cookies; Tangerine Almond Shortbread Bar Cookies; Cheery Delights; Fig, Apricot & Nut Biscotti; Fire-Roasted Chestnut Caramel Cookies; Cherry Walnut Bars; Double Chocolate Chip Cookies; Dark Chocolate Chunk Peppermint Cookies; and Sugar Cream Pie Cookies. This year’s cookie lineup featured all sorts of flavors — lots of chocolate, plenty of plenty of peppermint and even a bacon-filled pinwheel — but the cookie that wowed the judges was a tangerine almond shortbread cookie submitted by Indy resident Lori Goldsby. Judges appreciated the fresh citrus flavor and the eye-catching glaze of the shortbread bar cookie. Taking second place was a Fire-Roasted Chestnut Caramel Cookie submitted by Amanda Clark, while a Double Chocolate Chip Fudge Cookie with Candy Cane Buttercream placed third. 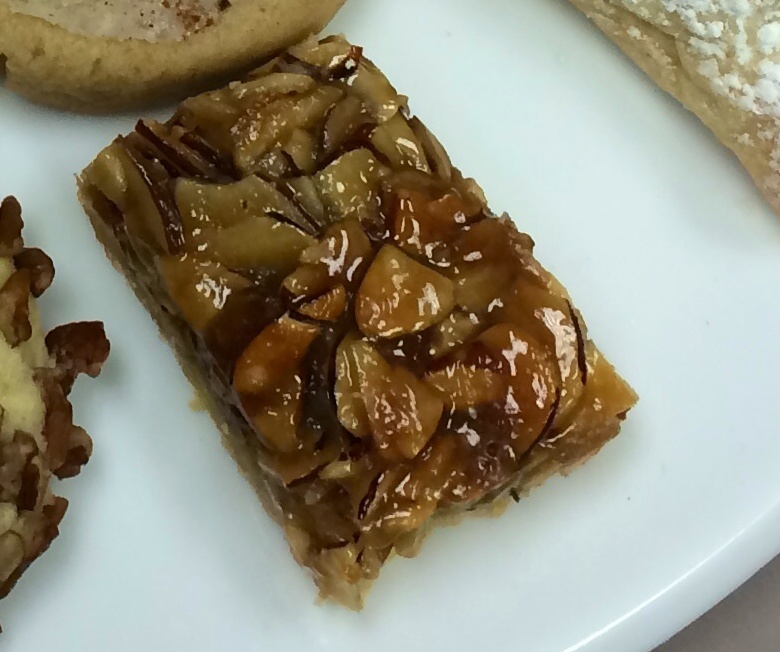 Kolache Cookies, submitted by Jennifer Cheezum, and Sugar Cream Pie Cookies, submitted by April Richwine, also placed in the top five. 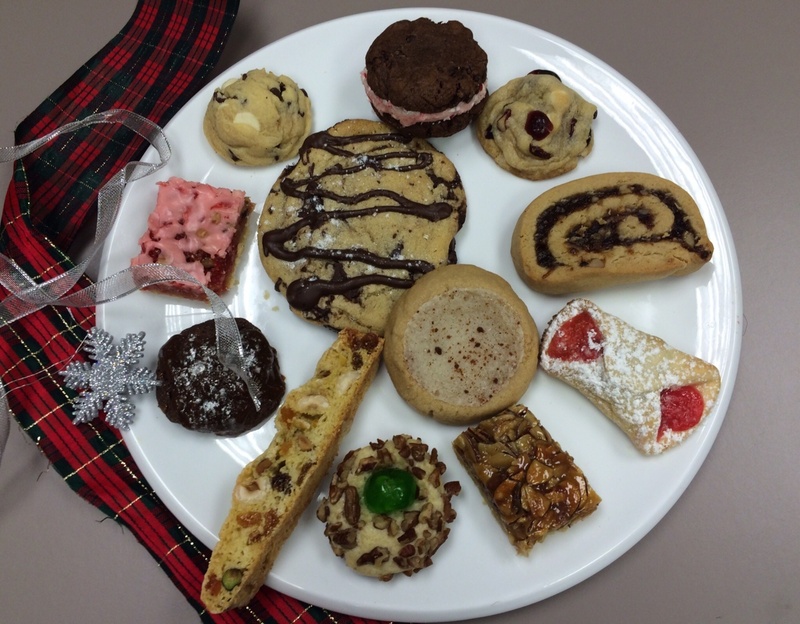 But alll of this year’s entries are definitely worth a spot on any holiday cookie plate! Zest tangerines, juice and chill. Prepare deep, half-sized baking sheet with foil-backed parchment paper, extending paper up the sides. Pat the dough into the pan, being careful to press up and into the sides. Chill the crust for one hour (up to 4 hours). In a heavy-bottomed saucepan, mix together the sugar, brown sugar, honey and 2 tablespoons of the reserved tangerine juice. Allow the sugars and honey to melt together over medium-low heat, swirling gently. Cook for 5 to 7 minutes, until the mixture darkens and caramelizes. Add the cream and increase the heat to medium. Cook the mixture at a low boil for 8 to 10 minutes, until it is richly caramelized and thick. Stir in the almonds and spread the mixture into the chilled tart pan. Bake for 30 minutes and then lower the temperature to 350 bake for another 5-7 minutes, or until the crust is richly browned. Cool and cut into rectangles or diamond shapes. For the fire roasted chestnuts: (Broiler Method) Preheat the broiler on your stove. Slice the chestnuts about 1/4 inch thick and place in a single layer on a baking sheet. Place under the broiler for 5 minutes. Transfer the chestnuts to a plate and allow to cool fully to room temperature. Rough chop the chestnuts and set aside. (Outdoor Method) Build a safe outdoor fire using lump charcoal. Be sure to keep a fire extinguisher close at hand. Wrap the chestnuts in heavy-duty foil so that they can move freely inside the foil pouch. Using a chopstick tip, poke three holes in both sides of the foil packet. Place the foil packet in the fire for 4 minutes. Flip and cook for another 3 minutes. Using tongs, remove the pouch from the fire and allow to cool to room temperature, approximately 30 minutes. Rough chop the chestnuts and set aside. For the cookies: Preheat the oven to 350 degrees. Line two baking sheets with parchment paper. Add the flour, cocoa, baking powder, salt and cinnamon to a sieve with a large dry bowl under it. Sift the ingredients together into the bowl, and then add the chestnuts and set aside. In a stand mixer with a paddle attachment, cream together the butter and sugar on medium speed until the mixture becomes pale yellow and well combined. Add the vanilla and egg and mix until combined, approximately 30 seconds. Slowly add the dry ingredients from the bowl into the stand mixer on the lowest possible speed. Once the mixture starts to come together, gradually increase the speed to medium until it forms a dough-like ball. Form 20 even-sized balls and place them on the prepared baking sheets.Bake for 15 minutes, and then transfer to a cooling rack with a sheet of parchment paper under the entire rack. Allow the cookies to cool while you make the salty caramel topping. For the salty caramel crack, add the sugar to a medium dry skillet and set over medium heat; the sugar will start to melt and turn a pale yellow color. Shake the pan and let it continue to melt. The sugar will start to turn golden brown and then a deep rust color — make sure to shake the pan often to mix. Once the sugar becomes a solid amber red, remove from the heat and add the cream and then the butter. Mix quickly with a soup spoon; it will start bubbling. Be careful not to touch the sugar with your hands.While the sugar is still soft and can be drizzled, spoon it generously over the cookies. The sugar will start setting to a hard crack as it cools fully. Sprinkle some flaky sea salt on top of each glazed cookie. Let the cookies fully cool before serving. Melt the chocolate in the microwave for about 1 minute. Stir. Continue to melt in 30 second increments until fully melted and smooth. Set aside. In a small bowl, whisk the eggs and vanilla. Set aside. With an electric or stand mixer, beat the butter until smooth and creamy – about 1 minute. Beat in the sugars, scraping down the sides every 10 seconds or so. The mixture will be granular. Mix in the beaten egg/vanilla until incorporated. Add the chocolate in a steady stream and beat until combined. Add the dry ingredients on slow speed. Fold in the chocolate chips. Do not overmix at any point in this process. Chill dough for at least 30 minutes. Preheat oven to 350 degrees F. Scoop about 1 Tablespoon of dough and roll into a slightly flattened ball. Bake for about 10 minutes, or until the cookies have just begun to set with the centers still appearing very soft. They will firm up as they cool. To make the buttercream frostig, beat the butter for 1 minute with the paddle attachment on medium speed. Add powdered sugar and slowly mix on low speed. Increase mixer speed to medium and add vanilla extract, salt, and 1 Tablespoon of milk. Beat for about 1 minute. Manually stir in candy cane dust. If your buttercream needs to be thicker, add more powdered sugar. Sift first 5 ingredients in medium bowl. In mixer, cream butter and sugars 3-5min, add eggs one at a time, scraping down sides of the bowl. Slowly mix in dry ingredients, fold in chocolate. Press plastic wrap to cover dough, refrigerate 24 hrs. To bake, preheat oven to 350 degrees. Form dough into 2-ounce balls and bake 15-18minutes. While cookies cool, melt remaining chocolate and extract. Drizzle cooled cookies with melted chocolate and cool on parchment paper. Preheat oven to 300 degrees F. Line 2 baking sheet with parchment paper. Combine the flour, baking powder, and sugar into a large bowl. Make a well, add the eggs, and lightly beat. Gradually incorporate the flour mixture into the eggs and stir until you get a somewhat sticky, dough-like mixture. Stir in the pistachios, hazelnuts, raisins, apricots, figs and lemon zest. Lightly wet your hands with cool water and bring the dough together into a ball. Transfer the dough to one of the baking sheets and pat into a log, flattening it slightly so that it is about 3 inches wide. Bake for 24 to 30 minutes, until when you press very lightly on top and it springs back. If it feels firm, leave it in the oven for a few more minutes. Let the block of biscotti cool on the baking sheet for about 10 minutes. Leave the oven on. Transfer the biscotti to a cutting board and, using a large, serrated bread knife, slice it into 1/4-inch thick slices. Lay the slices on their side on the baking sheet and return to the hot oven until pale gold, turning them halfway through cooking, about 10 minutes total. The biscotti should appear dry. If not, leave them in the oven for a couple more minutes on each side.. Remove from oven and let cool for a few minutes on the baking sheet. Transfer to a wire rack and let cool completely. Store in an airtight container for up to 2 weeks. Mix margiarineand sugar. Stir in syrup, egg yolks and flour. Chill. Roll into 1-inch balls. Dip into slightly beaten egg whites then nuts. Place on greased baking sheet. Press cherry into center of each cookie. If using icing press thumb in center of cookies prior to baking, then cool and spoon icing into center of cookie. Bake in 325 degree oven 20 minutes. Makes 4 dozen. Heat oven to 350 degrees. Combine all cookie ingredients except flour & baking powder in large bowl. Beat at medium speed, until creamy. Reduce speed to low; add flour and baking powder. Beat until well combined. Shape dough into 1 1/2-inch balls. Place 2 inches apart onto ungreased cookie sheets. Make indentation in each cookie with thumb; rotate thumb to hollow out slightly. Combine all filling ingredients in small bowl; fill each cookie with 1 teaspoon filling. Sprinkle each cookie with nutmeg and cinnamon. Bake for 15 minutes or until lightly browned. Cool 5 minutes; transfer to wire racks. Cream butter and sugars. Add egg and vanilla. Add flour, salt and baking soda slowly, mixing thoroughly. Stir in white chocolate chips, cranberries and pistachios. Form into balls and drop on a cookie sheet. Bake at 350 degrees for 8-10 minutes. Let them sit on the cookie sheet 2 minutes after removing them from the oven. Move to a cooling rack. Mix butter, flour, and ½ cup sugar until crumbly. Press into 9-by-13 inch pan. to oven and bake for another 25 minutes. Remove from oven and cool. Combine butter and sugar with enough maraschino cherry juice to make icing of spreading consistency. Spread thinly with icing. Sprinkle with coconut if you wish. When icing has set, cut into small bars. In a separate bowl mix together flour, baking soda and baking powder. In mixer bowl, cream together butter and sugar. Mix in pudding mix (dry) and vanilla until blended. Beat in one egg at a time. Then slowly mix flour mixture into the wet ingredients. If your mixer has a dough hook, use that to stir in both bags of chocolate chips. Line cookie sheet with parchment, and then use a small ice cream style scoop to scoop cookie dough onto the cookie sheet. Bake for 8-10 minutes. Bring dates, sugar and water to a simmer over medium-low heat and cook until thick (about 10 minutes), stirring occasionally. Remove from heat; add bacon, nuts and chipotle chile pepper. Allow to cool to room temperature. Cream sugar and shortening. Add beaten eggs. Mix together flour, salt and baking soda in another bowl; add to sugar-shortening-egg mixture. Mix all together well. Start with half of the dough; roll out on a floured surface until about ½ inch thick. Spread with half the cooled date mixture. Roll up dough and filling as you would a jelly roll. Repeat with second half of dough. Wrap in foil and chill overnight. Cut slices ¼ inch thick. Bake on parchment-lined or greased cookie sheets at 350 for 12-15 minutes. Cool. Add flour and sugar to butter or margarine and crumble in pastry blender. When dough is smooth, shape into four balls. Refrigerate dough overnight. In a medium bowl, beat the cheese and sugar until smooth. Blend in the yolks, optional flour, and vanilla. In a nut grinder, coffee grinder, food processor, or blender, grind the poppy seeds. Grinding produces a finer texture and better flavor. In a medium saucepan, combine the poppy seeds, milk, sugar, lemon juice, salt, and optional zest. Simmer over a medium-low heat, stirring frequently, until the mixture thickens, about 10 minutes. Let cool. The topping can be covered and stored in the refrigerator for up to 1 week. It tastes much better than the canned stuff. In a bowl or large bottle, pour the water over the prunes and let stand at room temperature for several hours or overnight. In a large saucepan, simmer the prunes and water until very tender, about 30 minutes. Drain, reserving ¼ cup of the cooking liquid. To the hot prunes, add the sugar, lemon juice, cinnamon, and optional cloves and mash until smooth. Stir in the reserved cooking liquid. Let cool. The topping can be covered and stored in the refrigerator for up to 5 days. In a medium saucepan, simmer the apricots and orange juice over medium heat until tender, about 30 minutes. Drain. In a food processor, puree the apricots with the sugar and lemon juice until smooth. The topping can be covered and stored in the refrigerator for up to 3 days.